Please begin with a bio and introduce yourself and Psicorragia to the world. Hi there Molly, thanks so much for this interview. 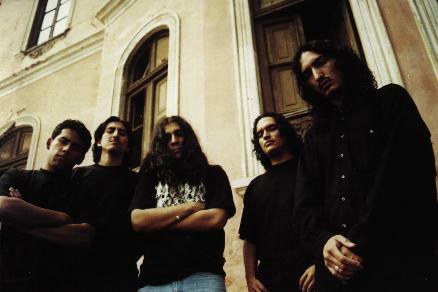 Psicorragia has already been some years in the metal scene, since 1994 to be accurate. It started when three of the actual band members got together to make metal a true expression. By that time, we could just make it a project because we were rather disoriented, we didn't find neither the real members nor the path that we were looking for. Nevertheless, the never-ending line as a band suddenly established during the years 1996 and 1997 as we met Alick and Antonio, whom are the guitarist and the pianist respectively. We well thought-out our proposal and released our first demo called "Otoño" in 1998 with six tracks which were well indented in the local market. After the astonishing reply, we wanted to keep on composing with the lasting mixture of our style and with the dark spirit that always goes with metal music. When we felt capable to record a CD, we just made contact with American Line, which was interested in our work. This way we got in the studio to record, and early this year, this beloved work was done, "La Pasión de lo Mortal". I wonder if this way we can brief our existence. 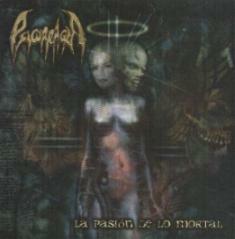 Your newest CD, 'La Pasion de Lo Mortal,' can you tell us a bit about this? "La Pasión de lo Mortal" is the unification of everything that our hearing and spirit fed us over the years. The result of the joining of five people whose blood is infected with metal. We do not place barriers when creating or when composing. We use each metal branch that makes sense and feeling. More than a product, it is our proposal and the first determined step to go abroad. We not only needed willingness and sacrifice to record the CD but also feeling and strength because we can't devote much time to music…just by now. Lyrics and music are complements that can differ depending on their heaviness and emotion. Being from Peru, can you tell us about the music scene there? Are there any noteworthy bands you'd like to mention? The Peruvian scene is somewhat uncertain. In fact, there are sometimes good times with many concerts but others with none. There were and there'll be bangers and rock bands but these stops in the Peruvian scene really caused a "wound" that affects us. Even though we are surviving in the Peruvian scene, we are still striving against the weakness of the Peruvian scene; that's why we can count so many years. 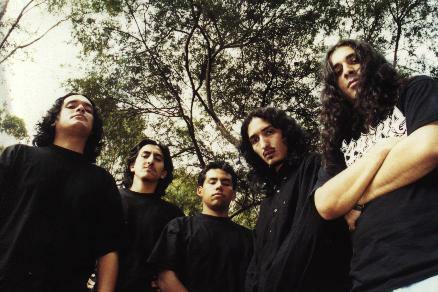 A few ancient groups are witnesses of this; we might mention some of them that just reached to record demos, but in order to be brief, I can tell you about Disinter (Brutal Death Metal); Epilepsia (Thrash); En las Espesas Nieblas (Doom); Crimson Death (Melodic Death) among others. And of course, the well-recognized Mortem, Kranium and Hadez coming from the 80's. Your music and style is very diverse and interesting. It seems to always be changing, adding in different elements, ups and downs... tell us some of your influences. What do you hope to accomplish with Psicorragia? Each band member has a huge variety of musical influences taking always as a priority a style, this comes to be the label for each one of us, what makes us unlike one another, but not in a negative side. On the contrary, it feeds our necessity of creation, seeking new procedures due to a give-and-take influence inside the band. Among our preferences, there are many musical likes which have feeling and soul, the insane metal goes first. In addition, to talk about our favorite bands takes time. They go from Death, My Dying Bride, Deicide, Moonspell, Jethro Tull, Iron Maiden, Slayer, and so on. What is your favorite era in your countries past? Can you tell us anything about ancient Peru that interests you particularly? What about the ancient gods/goddesses and the culture that existed before the coming of Christianity? Peru and its moorland are featured by myth, legends that come from ancient times. In many cases mystery and blood feature these stories, that's why foreign people get shocked when they discover these mysteries. Moreover, whether you consider that in ancient times Catholicism didn't exist, their Gods were different. I don't believe in God nor in saints, for this reason I don't care to talk about ancient Gods. Furthermore, I can tell you there were natural elements that benefited and punished their town. "El Sol", for instance, Inca's Empire God, always happened in human existence, religion and was believed ruled the world. The very best old part is the Inca Empire's triumph because of its organization and shared-exertion work. Give us your thoughts on the world-society. Do you think that something has gone wrong and that things seem to be getting worse and worse? It seems we can measure how much violence is in human beings. We create and esteem pain. Therefore, we see world similar to a stone rolling to an unknown abyss, but perhaps this is the process we should follow. On the contrary, reason condemns us to consider why things happen and how we can avoid them. I feel the world can have many advantages in a lot of aspects, such as technology and information. There are many doubts in the human side, however. Possibly, the combination of these aspects might mean that humanity's destruction and by the time it happens men will have lost contact with reality. We also can judge what should and shouldn't be done, is it really bad to vanish? When you contemplate death, what do you envision... do you see possibility in a part of us living on, or is this just a human hope derived from a fear of death? Death is the main trait in a human being and it's kind of difficult that somebody avoids it. Everyone knows death is wherever you go and you might suddenly be a victim. Sincerely, I don't think human beings are afraid of death (there is no reason), what happens is there exists a horrifying fear of the agony when you may be involved. In addition, selfishness from relatives and friends is also present. Sometimes, they damn their beloved relative who is in peace with death because they won't have him in their minds anymore. But, this is not entirely bad because it comes from a positive feeling. Whatever it is, we are free men due to death's liberation. Our song "Estrofas a la Muerte" was created for that purpose. Personally, I've thought of that, what I wanted to know is the truth because it comes from there and, indeed, this is the most difficult for human beings to imagine. I don't know, having known people who have done something astonishing is very nice for everyone. Likewise, I don't feel this is a main concern. Uhh…maybe Nietzsche, Jim Morrison, the Peruvian poet Cesar Vallejo, Chuck Schuldiner that some days ago gave us a leave-taking. Or maybe some fiction people like Hannibal Lecter, the Rosemary's baby, etc. How can those interested obtain your release? I think everyone, that has read each of our answers from this interview, is developing his/her own thoughts of what we do as a band. So, you just have to email us or our label American Line Productions. We'll always reply to you. As great as Psicorragia is, without the proper distribution no one outside of South America will be able to hear you unless you can get good distribution. It seems the vast majority of S. American bands, many very talented, do not get their releases distributed beyond their locale. What would you say are the main causes behind this? American Line Productions has a very good underground distribution around the world. I hope this grows up to please our expectations that, of course, have a relation with going overseas, far from this continent, taking our identity with pride and pleasure. Nevertheless, you are right…I have no idea why but it is very uncommon that even the best bands can get great exposure in foreign countries. Possibly, there is too much love to its own, I don't know, but I hope things change because there are many astonishing, high-quality bands of assorted styles in South America. Thank you Molly for this opportunity. Regards to the dark souls that visit your website. And if you feel identified with these thoughts, don't hesitate to contact the band.